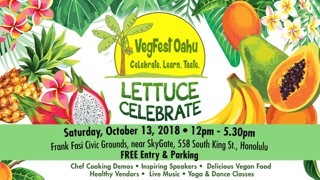 Plastic Free Hawaiʻi will be offering our awesome merchandise and outreach at Vegfest Oʻahu on Saturday October 13, from 12:00pm-5:30pm at Frank Fasi Civic Grounds at Honolulu Hale. We will have our Plastic Free Hawaiʻi bamboo sporks, stainless steel straws, bamboo utensil sets, reusable bottles, tote bags and more for sale to help you go plastic free! You can also find us and the Plastic Free Hawaiʻi Water Refill Stations at Children and Youth Day on Sunday, October 7, from 10:00am-3:00pm at the State Capitol and at the North Shore Menehune Surf Contest on October 20 & 21 at Haleʻiwa Aliʻi Beach Park. Remember to BYO reusable water bottle!